When you have a film absolutely brimmed to the edges with big names the result is normally either a superlative masterpiece (The Grand Budapest Hotel), or an unmitigated disaster (Movie 43). Hail, Caesar! is the rare exception to that rule in that it is neither masterful nor disastrous, but merely OK. There is unquestionably more good than bad here - there are elements of the film that border on masterful, but nothing comes close to disastrous - but Hail, Caesar! just completely fails to come together in the ways that it should. Perhaps I was expecting an entirely different film to the one that I saw. After all, the film's trailers and marketing sold a high energy, rapid paced investigation into the abduction of a movie star. 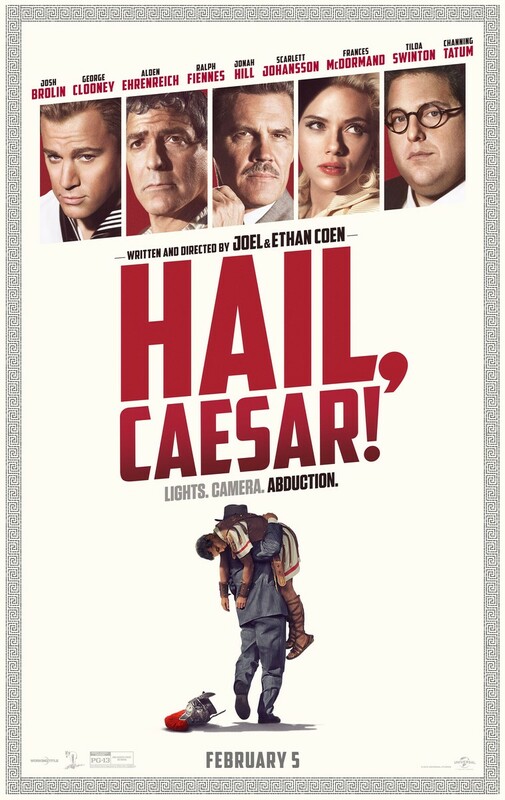 Whilst this is the film's focal narrative, there are a number of other smaller subplots that run through Hail, Caesar! and it stops the film coming together as one coherent whole. To this day, I have only seen one other directorial effort from the Coen brothers: Inside Llewyn Davis, which I adored. But I'm more than familiar with their tropes and styles, and the ways in which they, lately, seem to make the same thematic ideas twice in different generic styles and so forth. Hail, Caesar! finds the Coens in a strange place. There are an abundance of characters here, and therefore an abundance of recognisable faces on screen, One second you're watching Josh Brolin have a conversation with George Clooney, before Tilda Swinton appears on screen as two separate characters in two subsequent scenes, and then suddenly Scarlett Johansson is diving into a swimming pool dressed as a mermaid and Channing Tatum is a sailor dancing on tables in a bar. There's a ridiculous amount going on here, and it does admittedly all connect together. No scene feels irrelevant in terms of the film's narrative, they're just each so wildly different that almost every scene transition feels jarring. By the time Channing Tatum is leaping like a ballet dancer onto a submarine before staring dramatically into the camera it's difficult to really care where the story is heading next. One of Hail, Caesar! 's biggest issues, though, is its over-reliance on satire. The film foregrounds satirical comedy in an enormous way, and it has every right to given its 1950's Hollywood setting. Anyone going into Hail, Caesar! unprepared for satire is bound to have a nightmarish time, but even though I knew full well that the film would delve into this comedic style I still struggled to be wow-ed by it all. There's just too much of it. What begins as a fun little comedy twist with the odd clever line here and there soon grows into a full blown satirical extravaganza and the film doesn't have the energy nor the interesting characters nor the exciting story to support it. Perhaps if Hail, Caesar! were more like the film its trailers promoted (AKA, much faster paced with much snappier dialogue, and much, much funnier) then this satirical overload could have worked considerably better, but as it is the film crumbles under the weight of its own flawed comedic style. Besides one scene early in the film, in which a director (Ralph Fiennes) tries his hardest to make an actor pronounce one dodgy line correctly, almost all of the humour falls flat. Yet, every now and then this tiny spark of magic appears and the film takes off for a short while. The performances are uniformly excellent all round, with the relatively unknown Alden Ehrenreich more than standing his ground against the film's bigger names. The production design is flawless throughout, the film offers us glimpses of a variety of genres inside the film (it is set in Hollywood's Golden Era, after all) and each one has been designed seamlessly. Roger Deakins, fresh from his Oscar nomination for the very different Sicario, does a fantastic job with the film's cinematography; even when the story is fizzling out and the humour isn't working, the frame is alive with colour and spectacle. A song and dance sequence in the middle of the film, led by the now reliably enjoyable Channing Tatum, is the film's crowning achievement by a long mile. It boasts the superb performances, cinematography and production design just mentioned, but it is perhaps one of the only scenes in the film to also work in terms of character depth, humour and narrative. It's also a bonus that the entire sequence is almost effortlessly inventive, finding ways to become funnier and more exciting with every passing second. If the whole film packed the energy of this one sequence, Hail Caesar! could have been something truly exciting. The film is superbly cast, every actor feels at home in their role and each of them give fantastic performances, but the story and the scripting fails to live up to their potential. Perhaps the Coens were simply carried away by this golden opportunity of a setting and realised the satirical capabilities it had, but it doesn't benefit the film in any way. What was once satirical becomes sloppy, what was once giddy and fun becomes awkward. Hail, Caesar! is never dull, it's a consistently engaging film mostly due to its cast, but it lacks the character dynamics and narrative conviction to be anything more. There are flashes of ingeniousness, but they're trapped inside two hours of flawed humour and poor storytelling. Better luck next time, eh? To Summarise: While it boasts eye-popping production design and charismatic performances from its star studded cast, Hail Caesar! is ultimately too jarringly uneven and too rarely inspired to make for a truly satisfying film experience.